Use it up, wear it out, make do or do without was what they said during the Depression. Words my grandparents surely said. My mother said when the Dust Bowl cleared, her parents view of what we call “antique” was “old” and threw it out and bought new. She said her grandfather sold a place setting for twelve original Fiesta Ware at a garage sale. She never forgave him. Some of the more enjoyable times we had were scouring antique stores buying back pieces of her childhood – a Fiesta mug was fifty bucks before they started making the stuff again. Somewhere packed among my children’s things is a child’s tin cup just like hers with the cow jump’s over the moon. In my cupboard and frequently used, is a Fire King green milk glass mixing bowl I grew up with. Unlike my grandparents, my view is that old – that is antique, meaning older than me. Proof it’s built to last. My stepson introduced me to Descoware, the precursor to today’s enameled cast iron Le Creuset. He says it is superior to today’s product. Who am I to dispute this especially when Etsy has a cute yellow bean pot? Who knew I needed a bean pot? 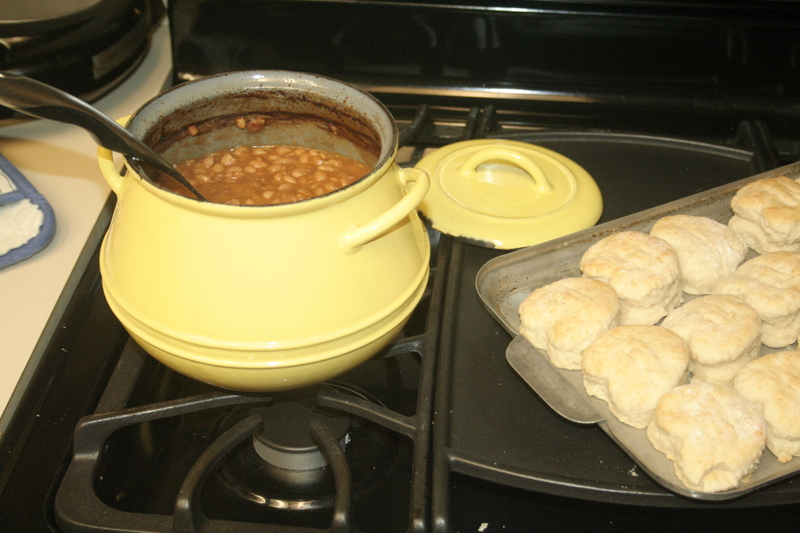 An old bean pot, duly delivered requires, of course, an original Boston baked bean recipe along with somebody’s (authentic!) great-great grandmother’s southern buttermilk biscuit recipe, downloaded from the Internet, cut with my mother’s heart shaped cookie cutter. The food was delicious, if not heart healthy, the trade-off to “old things.” In compensation, I have on order heirloom seeds for tomatoes, eggplant, peas, bell peppers and so on. Somewhere there is a mathematical formula, I’m sure my Dad must know it, for figuring the fair labor of tilling, weeding, minding and eating the fruits of one’s labor that cancels out the fat and cholesterol from bacon and butterfat. In the meantime, I notice that Etsy has Fire King milk glass.